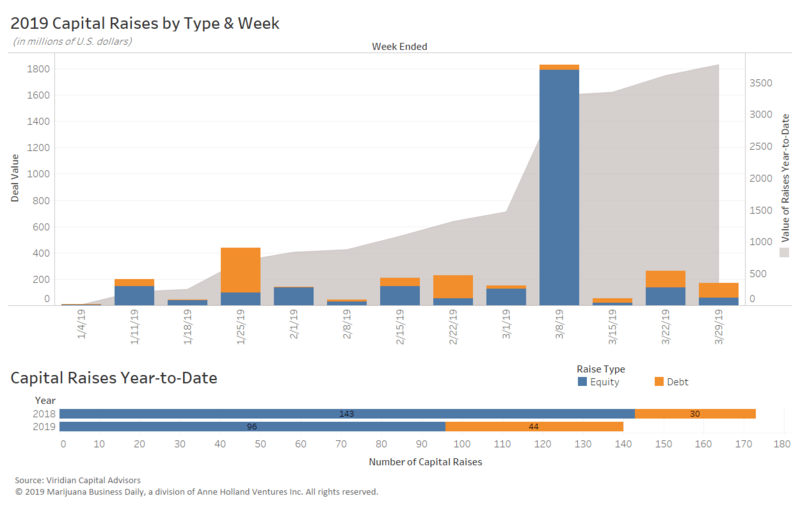 Public cannabis companies have been involved in a total of 33 debt raises for the first 13 weeks of the year compared with just 19 in the same period in 2018. The value of debt raises totals $764.9 million in 2019 compared with $474.8 million last year. The fact that there are more public companies in the cannabis space compared to the previous year may be a contributing factor, but the data also shows that these companies are actively seeking funding – primarily to drive further expansion. Moreover, debt funding gives companies an alternative to equity financing, which requires businesses to issue more shares. 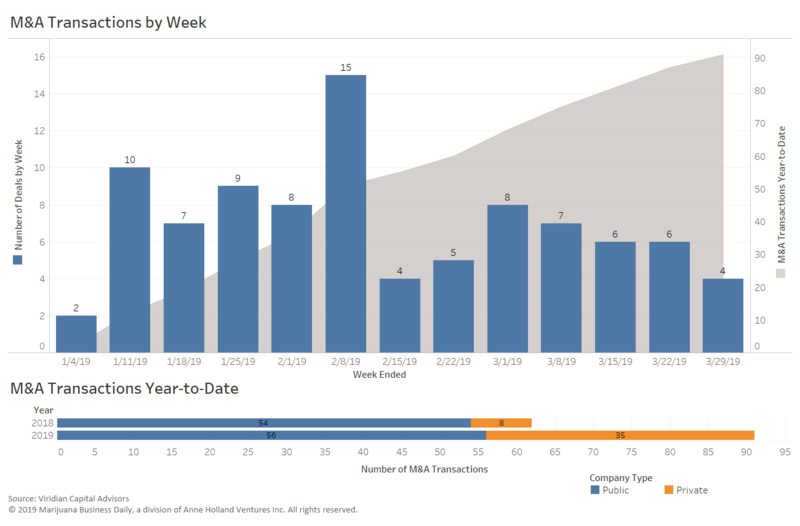 The data below, provided by Viridian Capital Advisors, is through the week ended March 29. Flower One, a Toronto-based cannabis cultivator with operations in Nevada, closed its debt offering of 50 million Canadian dollars ($37.5 million). The proceeds will be used for the payment of outstanding debt, ongoing construction and development of its Nevada production facility, working capital and general corporate purposes, the company said. MPX International, which was spun off into an independent company after its parent, MPX Bioceutical Corp., was acquired by iAnthus, closed a CA$26.9 million equity offering. The original placement had targeted up to CA$20 million. Arizona Natural Remedies, which has a dispensary in Phoenix, an Amado-based cultivation and processing facility and a wholesale business that operates throughout the state. Red Barn, a medical marijuana group that has growing facilities and dispensaries in New Mexico. Vireo, which trades on the Canadian Securities Exchange as VREO, did not disclose the value of either deal.